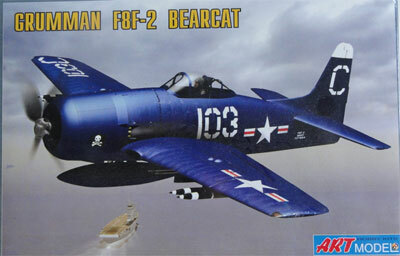 The Grumman F8F Bearcat is an American single-engine high power propeller driven naval fighter. 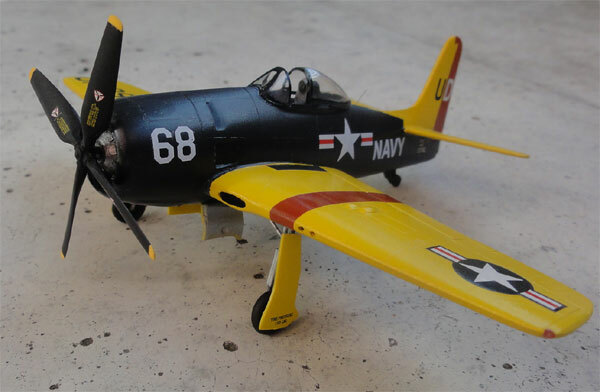 In the early nineteen forties, the US Navy had a need for a very powerful aircraft as the successor of the Grumman Hellcat. It should be operable from aircraft carriers. 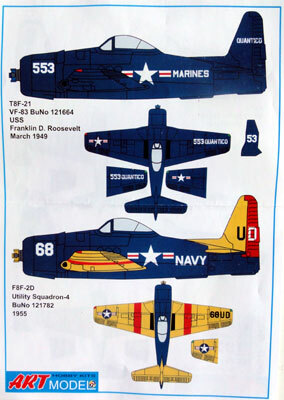 Work at Grumman started in 1943 but the prototype was not ready before 1945. The engine became the Pratt & Whitney R-2800 engine with a large four-bladed. For large visibility, the pilot got a large bubble type canopy. The fixed armament were four .50 Browning machine guns. The first production aircraft was delivered in February 1945 to VF-19 but World War II was over before the Bearcat saw combat service. 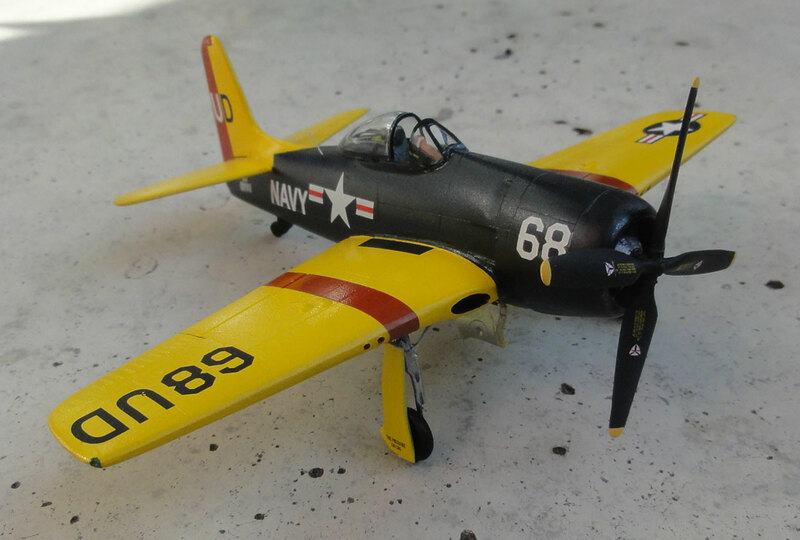 After the war, the US Navy had as many as 20 squadrons equipped with the Bearcat The Bearcat was also introduced by the US Navy demonstration team Blue Angels August 1946. The type was also used by the French Air Force in Indo China. It had a very good manoeuvrability and was later replaced by the first post war jets. Many Bearcats are used in the warbird and racing scene nowadays. 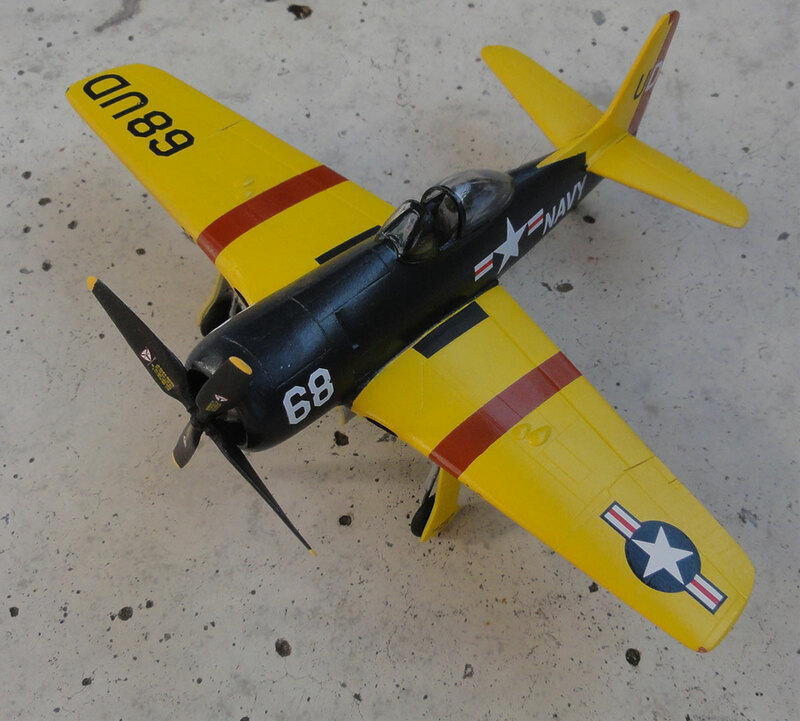 Plastic models of the Bearcat were virtually non-existent or only very rough models existed. 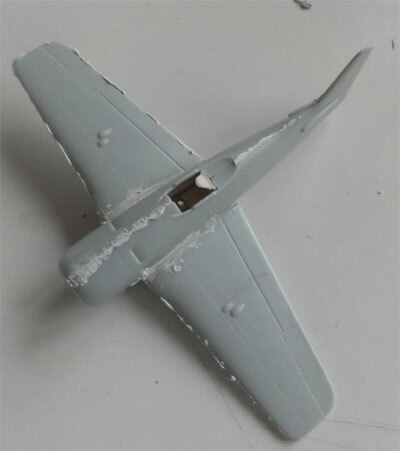 Trumpeter of China issued a good 1/32 kit in 2010. 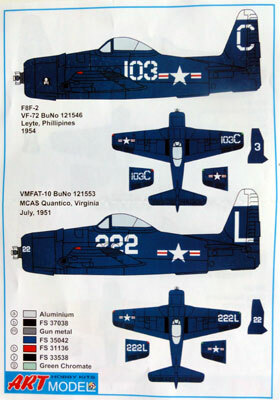 In 2011 ART Model issued a good 1/72 kit of the Grumman Bearcat. 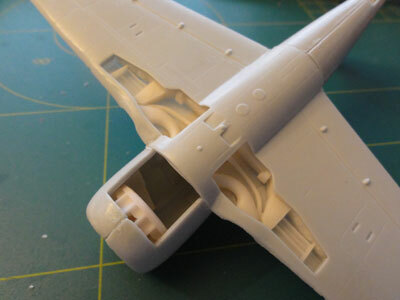 It is short run with about 35 plastic parts and a few resin parts like the main undercarriage bays. - a very colourful scheme of F8F-2D with a yellow wing with red bands of Utility squadron 4, around 1955, code "UD"
Assembly was started as instructed. 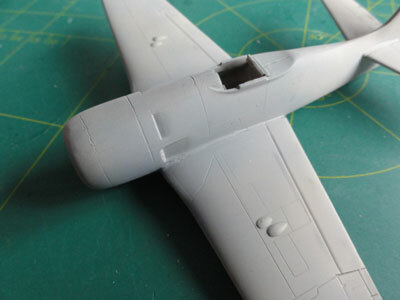 The cockpit is very small and not a lot details are to be added as they are not visible. The seat head rest has a strange kink and was bended straight. 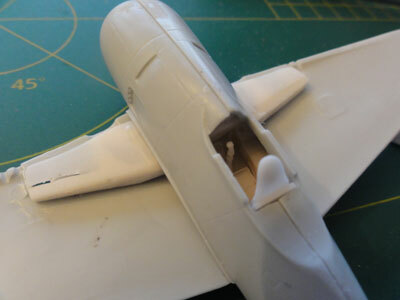 The main undercarriage bay are in resin and nicely detailed but does not fit into the two wing halves, it is too thick. 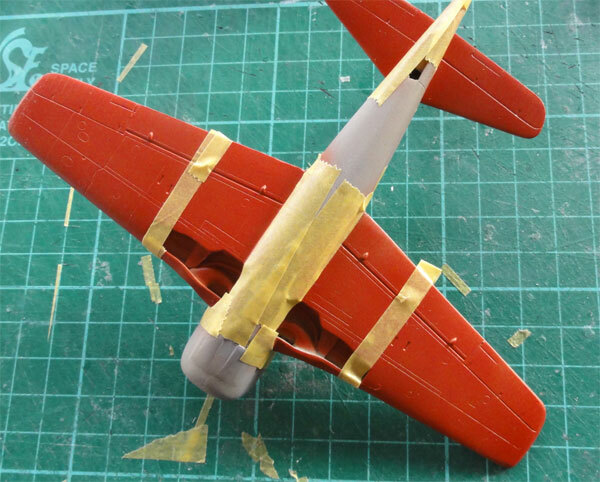 I sanded off as much material from the resin bay "roofs" as possible, but still needed to bend the wing halves. Clamps were used and still I had to close gaps user filler and plastic rod. The cowl was set and the lower panel fitted and it all needed sanding. 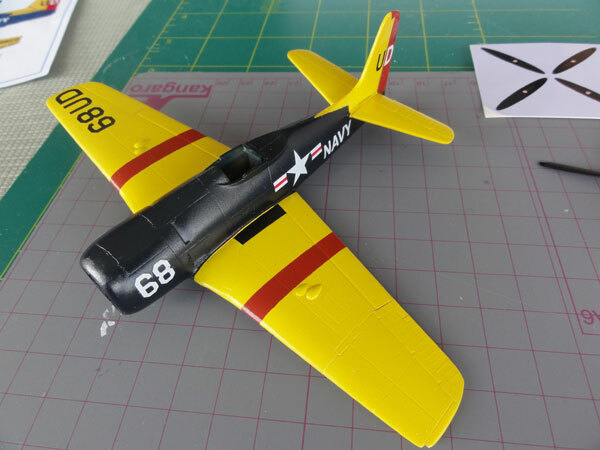 For dihedral, the wingtips were taped and the model set aside to dry. In the engine, a hole was drilled for the propeller shaft. Sanding and sanding at all spots. 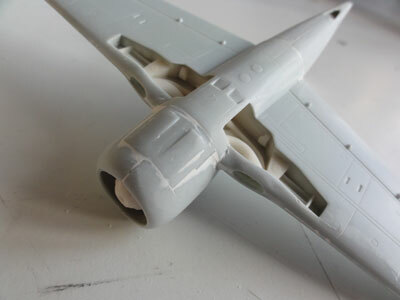 After assembly, the model got a grey primer with the airbrush. 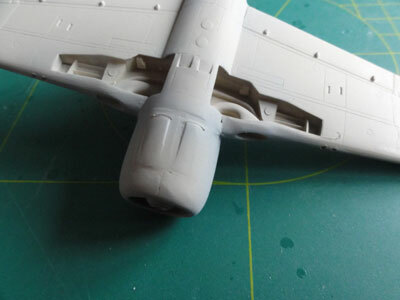 After correcting any flaws, the model was ready to get its paint. First, on the wing a mat red base coat was added with Gunze Sangyo Acryllic H13. Yes, red as it makes the yellow colour more deep for the eye. 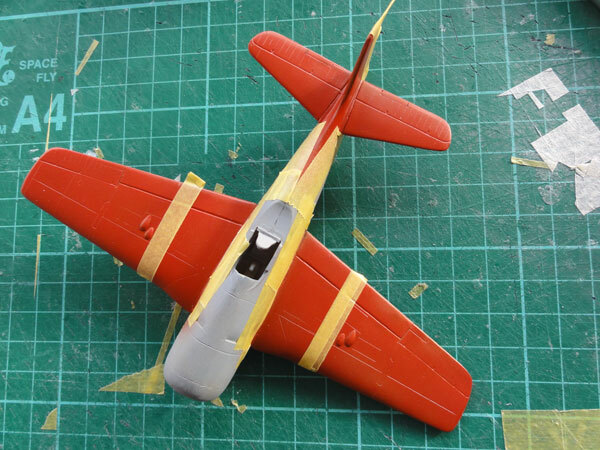 The red bands were masked and the yellow sprayed, using Gunze Sangyo acryllic H4 . 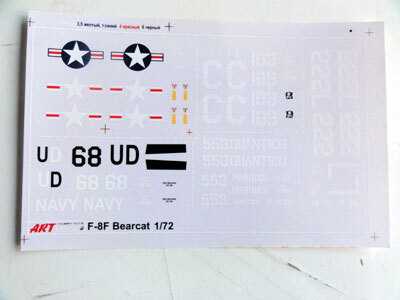 After drying and masking, the typical US Navy colour of the period of Gloss Sea Blue was airbrushed on the fuselage using enamel very old "authentic Humbrol" HB9 sea blue gloss (or use White Ensign Models WEMCC ACUS07 FS25042). Final assembly was now done. 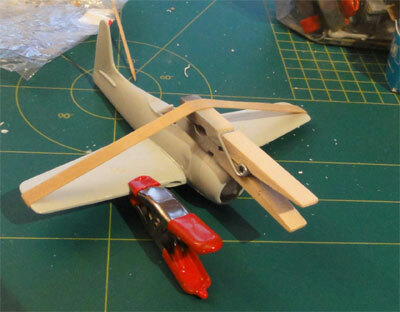 The undercarriage, propeller and tail wheel were installed. 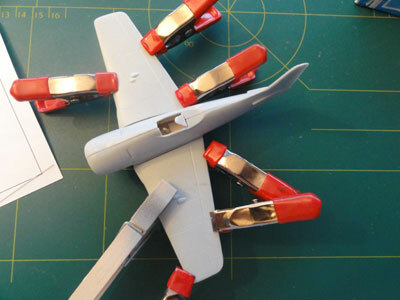 The main gear legs are difficult to align properly, and I replaced the legs with metal ones. The main gear bay colour: usually is it also very dark (sea blue), but for the aircraft with yellow markings I was unsure. I painted the bays aluminium with a paint brush. In the cockpit the usual throttle and some details from card were added. It was painted mainly black with a paint brush. A small gun sight was also added. 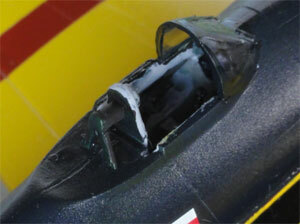 The windscreen was carefully fitted, the gaps closed with white glue, smoothed and painted when dry. Some weathering was applied on the moving surfaces gaps with PROMODELLER Black wash, to suggest some oil streaks. 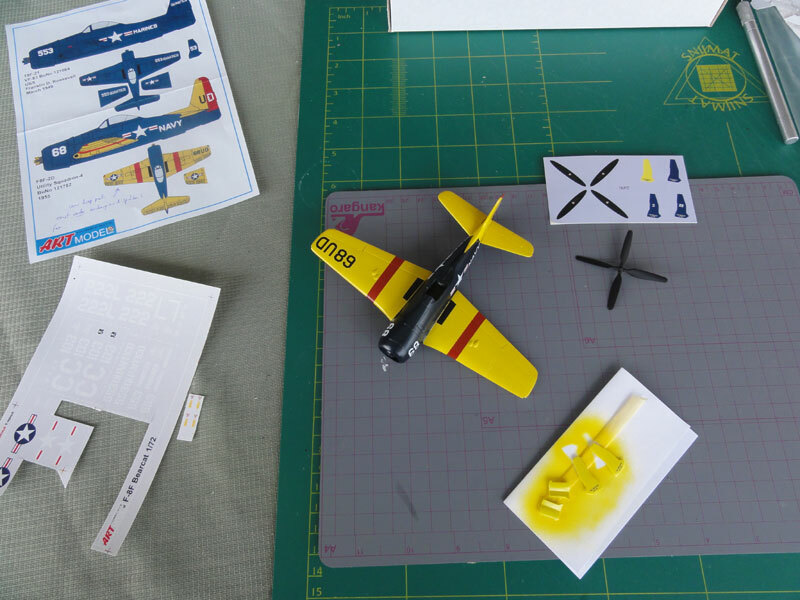 The wingtip anti-collision lights notches were cutt out at the wing tips, painted on and given a drop of Microscale Kristal Kleer. 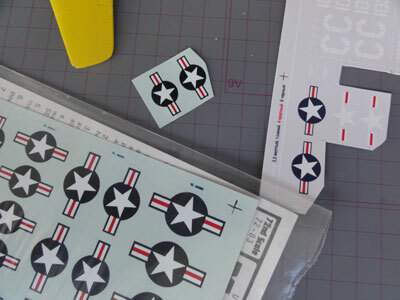 The overall model was finally given to protect the decals an overall gloss coat with Johnson Future/Pledge. It now looks fine with an even shine.